Recently I wrote about my new healthy eating tips, or rules, that were part of my general diet overhaul. After a rather extended “babymoon”, in which I had been eating incredibly naughty things with the excuse that I needed extra calories for breastfeeding, I decided that enough was enough. The handfuls of Haribo and nightly chocolate ice-cream were all fun while they lasted, but I really need to get back into healthy habits and completely overhaul my diet. And I realised that where I was most frequently falling down was with my snacking. I have an incredibly low tolerance level when it comes to hunger pangs and within ten minutes of feeling hungry will be tearing through the cupboards looking for the quickest fix. Pre-baby, I would put together a salad, maybe open a tin of sardines, toast a pitta bread to put them on, that kind of thing; but now that I have my bonny little companion on one hip I tend to make panicked choices and go for things like (more often than not) choc-chip cereal bars. So the biggest part of my diet overhaul has been to address the snacking situation and make sure I have things to hand that are portable and that don’t require any preparation or need to be refrigerated. And of all the old staples I’ve bought back in and new snacks I’ve discovered, I think that almonds have been my most successful addition. I’ve been keeping helpings of them (one portion is about 28g) to hand so that whenever I get the urge to sniff out bad things I can munch on my almonds instead. It’s a bit of a no-brainer, swapping sugary cereal bars for handfuls of almonds, I know; I’ve just been doing a bit of Google research and the nutritional benefits are almost polar opposite! A portion of almonds has around 14% of your daily dietary fibre*, 10% of your calcium and is low in sugar (about a gram). My favourite type of cereal bar (I won’t embarrass myself by telling you exactly what it is!) is about the same weight as a serving of almonds and has 8g of sugar and 0.7g of fibre as well as nearly three times the amount of saturated fat. Oops. It makes absolute sense that if you’re into your skin and hair products you take care of yourself from the inside too. In fact, it’s so much more important, though never quite so glamorous-feeling or swankily-packaged! I’m making a real effort at the moment to make good food choices and incorporate all of the right nutrients and vitamins into my diet, especially with my skin being slightly drier since having a baby and my hair trying to generally disassociate itself from my head. 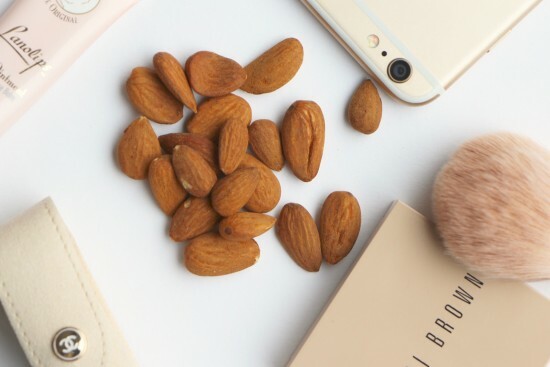 Swapping my bad snacks for almonds is – I think – probably the easiest and best change I’ve made so far! If you’d like more information on almond snacking then there are loads of tips and recipes for jazzed-up-almonds at almonds.co.uk. *The nutritional information provided is all based on Recommended Daily Allowance (RDA’s) set by the EU. This post has been sponsored by the Almond Board of California.